First, I made a country. Now, I need to tackle the world. I've started working on the world map for Chains of the Sciell, Book 2 of The Merging Worlds Trilogy. I'm doing this more for fun. The characters never leave Jael. It'll be useful to include a world map in the book since the story mentions other countries. I want my map to be accurate- putting the mountains and rivers in the correct places. I created atlas cheat sheets by collecting images using Google. To get the results I wanted, I had to search for "Physical Maps." I printed out each image and pinned them in my sketch pad so I can use them as reference. 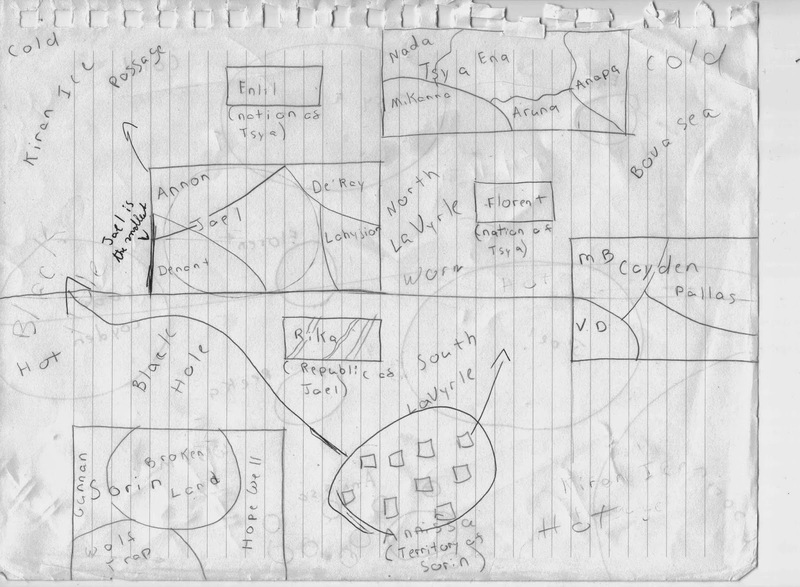 Follow Auden's board World Building: Map Making Reference on Pinterest. I drew a rough sketch to get an idea of where each landmass was--as well as the location of major bodies of water. Some things have to be moved around. This map has to make sense with my story. At the bottom left of my world, sits Sorin (the largest square at the bottom). It's a major weapons manufacturer. The largest square above it is Jael. 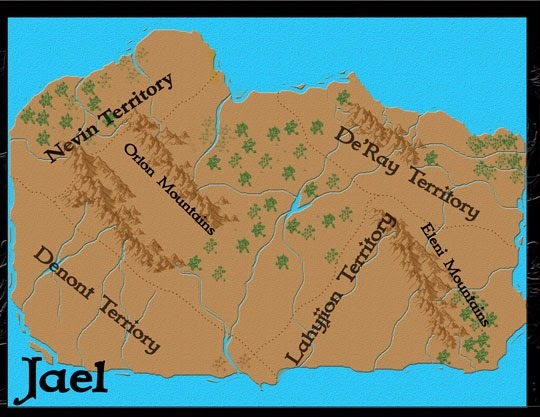 In Southwest Jael is a city called Denont, which is a major port. Most of Sorin's weapons come into Jael through Denont. I'm still trying to figure out how-- if it's smuggling or if the Denont leaders are fudging the import papers so they can take some weapon off the top without anyone noticing. Anyway, when the world is thrown into chaos, Denont has the most weapons in all of Jael. This becomes important to the story. However, between Sorin and Denont sits the Black Hole. A passageway that eats ships. Right now, traveling the Black Hole is the only way Sorin can get weapons to Denont- which is unlikely. Denont needs those weapon and they have to come from Sorin. I'm thinking of moving the little island Rika. Its made up of canals. This way ship from Sorin can travel through Rika to get to Denont. This might be tricky though. 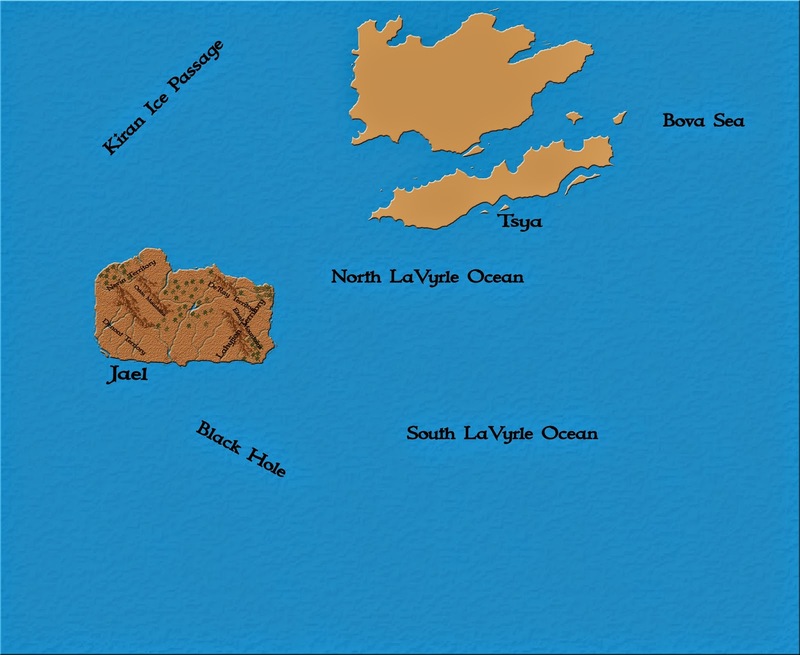 Jael (where Denont is located) owns Rika. This is why I'm doing a world map. I'v mentioned this before, countries don't exist in a vacuum. Trade is important. No land has everything it needs. So far, this is what I've created in Photoshop. I working as slow as I can because I want to do this right. 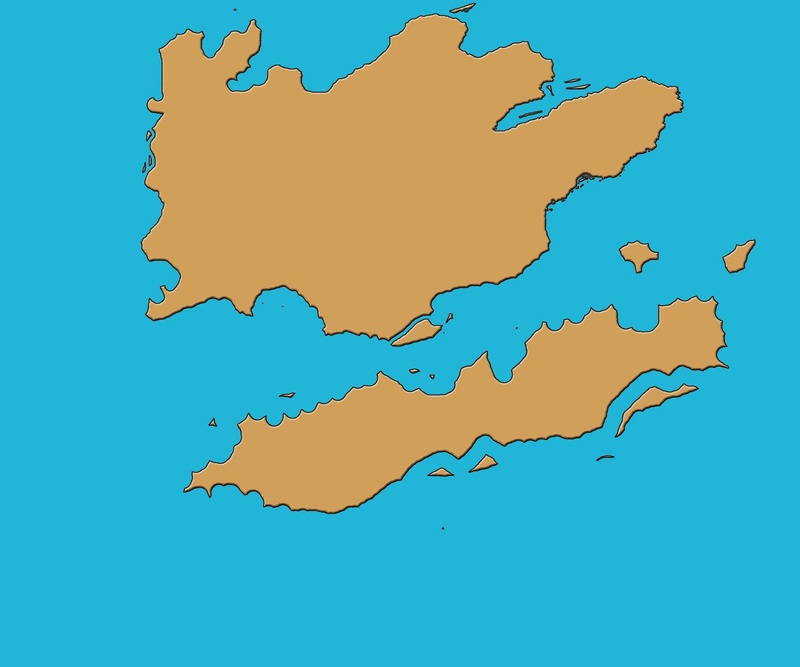 It took me forever to create the second landmass. I painted a big brown blob. Then, I erased some sections while painting on more until I came up with a shape I liked. I'll have to do this 6 more times. 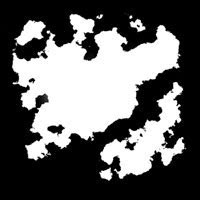 I drew the landmass on a separate image as a new layer. I needed it to be big. It's easier to edit that way. I then moved that layer to my world map. I'm going through this tutorial again to get the basics down. I created the above image of Jael using this tutorial. I'm also looking for other map making tutorials because I want to add some fun textures and brush strokes. I started creating this until I realize I probably wouldn't be able to move this landmass to another image. Creating that map requires a bit more advanced Photoshop skills. I found the previous tutorial easier to follow. I have a couple of images I need to create for this book. Since I plan on releasing Chains of the Sciell in March, I'm a little behind and school starts in 2 weeks. I'll also need to work on the book trailer. I love Adobe Creative Suite. Update: Chains of the Sciell is now available.